How to bring down practicing time by using a different mind set. You need to prepare a new piece. Fun, you think. You start practicing, the way you always do: take one chunk and practice it slowly. With the metronome, perhaps. Sound, intonation, phrasing: you meticulously check your progress. Every detail needs to be up to your standard before you can speed up the tempo. Until you are satisfied and go on to another chunk. By now, you have started to feel slightly bored… but hey! This is what you need to do, right? So what is wrong with this picture? Well, nothing except that it is a huge WASTE OF TIME. 1. When you get bored, your mind starts wandering. Despite your best attempts to keep with the task at hand, you are just not in the moment. You can see that is not a good recipe for effective learning. 2. By starting from step one every time, you are holding yourself back, and down… it is like reading letter by letter instead of full words and sentences… Imagine what that does to your self-confidence? You are basically telling yourself you are a beginner. 3. Checking ‘after the fact’ is a poor learning strategy. You know what I mean? You play slowly, checking for mistakes. When something is not good, you stop, repeat that spot a few times, go back to the beginning of the chunk. But, waiting for mistakes to be improved works like a self-fulfilling prophecy. The way you see yourself playing has a direct effect on the results. Moreover, practising in this way engages left-hemispheric brain activity, when in order to perform complex motor skills optimally right-hemispheric process needs to be activated. 5 steps to reduce practicing time by using a different mind set. 2. Hear how you want it to sound. Turn on all your senses, feel how it is to play it, see yourself playing. Play the chunk in your mind a couple of times, until in your visualisation it sounds exactly how you want it. 3. Now play it on your instrument, even if a bit under tempo. Make sure you keep the result you want to produce vividly in your mind …Was it how you wanted it to sound? If not…why not? Was your mind going back to analytical mode? Or did doubt crawl into your mind? Maybe you need to improve your concentration skills? 4. One thing at the time. We like to believe we can multi-task…that we can focus on different things at the same time. Each time your mind wanders to thoughts that are not performance-relevant, you take precious attentional capacity away from performance-enhancing focus. Sorry to disappoint you…our attentional capacity is limited. 5. Find the right focus. To be able to perform up to your abilities on demand, you need to find the right cue for each chunk or passage. Yes, training muscles alone won’t do the trick…you need to know how to activate your motor system. Is sound perhaps not the right focus for this passage? Try with the kinesthetic sensation, or a visual image…or a mood word. Our ‘non-thinking’, unconscious mind controls our movement. In order to execute motor skills optimally we need to engage our senses, not our thinking mind (Gallwey 1986). Feel the movement, see it and hear it. “Hear the sound before you produce it.” “Feel your balanced position”. “ Feel ‘lightness’ in your fingers.” “Feel the smoothness in your movement.” “Feel the air blowing”. 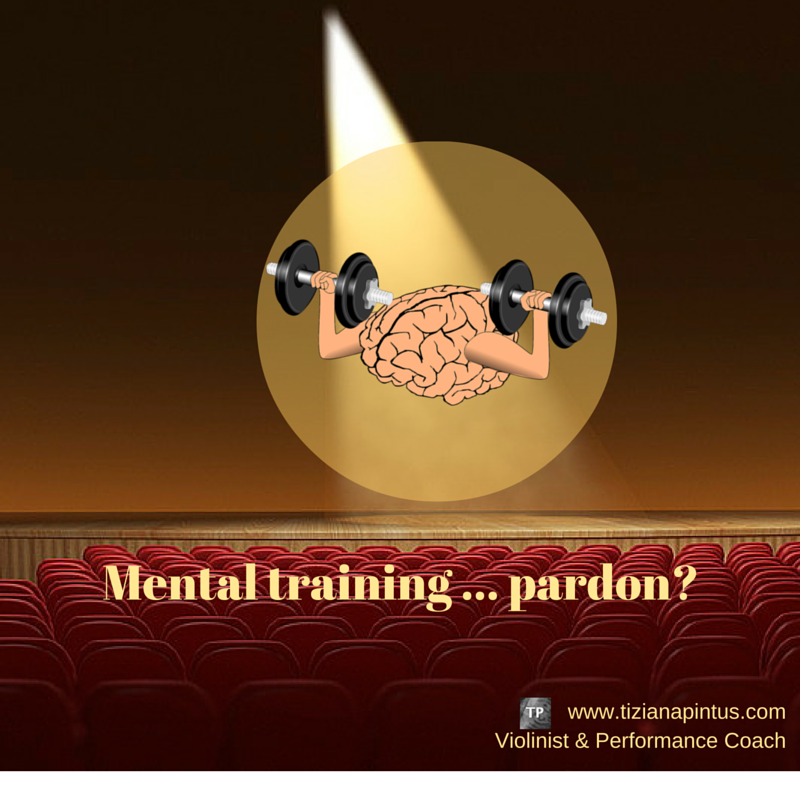 What distinguishes a great performer from the rest doesn’t just lie in the muscle training but on the mental training in particular. It is vital to learn how to activate right brain processes to ensure optimal (and reliable) motor skills execution. Good news. Mental, or performance, skills are just like any other skill: with practice you too can master them. Austin Naber is a world-record holder in cup stacking. He practices 3-4 hours every day. How will David fare against him? EEG helmets capture the differences in their brain activity, and reveal a deeper truth about why so much of what the brain does is unconscious.